For years, the LilyPad platform has been the board of choice for developing soft circuits and e-textiles. It was designed to be easily sewn onto fabric with conductive thread, and is even washable so you can clean the garments they are attached to. Like many other boards in the Arduino family, the LilyPad has received a chip upgrade to the popular ATmega32u4 board. The original chips used on the LilyPad line, the ATmega 168 and 328, require external chips to handle USB communication. For various reasons, these chips were left off of the LilyPad boards, requiring the use of a special cable to program them. The swap for the ATmega32u4 finally brings USB programming to the LilyPad line. Beyond USB serial support, the 32u4 can also mimic other USB devices like keyboards, mice, or MIDI devices. For a soft circuit, this is rather exciting for making projects like glove twiddlers or drum machine pants. To help power the LilyPad USB, Sparkfun has added a JST connector for a Li-Po battery. No longer do you have to solder or sew in a battery pack. An integrated charging circuit ensures that you can keep your battery topped up, and a power switch stops you from wasting that precious juice. I’ve worked on a few sewable projects and I really appreciate the new USB support. I’m disappointed in the lack of pins broken out on the new board — only five digital pins and four analog. 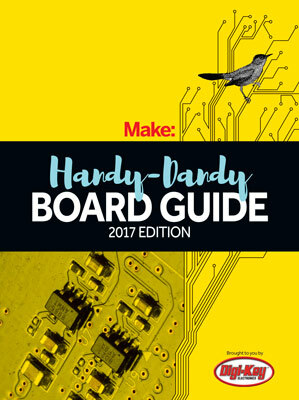 Sparkfun chose to limit the pins to streamline the board and give users more room between pads to work without worrying about shorting connections. I would love to see a fully pinned LilyPad sporting the 32u4 chip but until then, this will by my soft circuit board of choice.